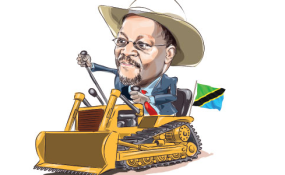 The rise of Alphayo Kidata, Tanzania’s High Commissioner to Canada who has had his tour of duty abruptly ended by President John Magufuli, could be described as meteoric. His fall equally sharp. Until yesterday night when a short statement from the ministry of foreign affairs announced Mr Kidata’s sudden dismisal, he was thought to be one of Dr Magufuli’s blue-eyed picks for his administration. Kidata rose from being an ordinary civil servant functionary to become one of the most trusted officials by President Magufuli. His star shone early in the first days of the President’s administration. Having served as a middle level civil servant, the soft spoken Kidata started rising through the ranks, first as deputy Permanent Secretary in the Regional Authority and Local Government ministry and then in, August 2013, as Permanent Secretary in the ministry of Lands, Housing and Human Settlement. When the President was looking for capable and trusted hands to clear rampant tax evasion in the months after he was elected into office in 2015, it was to Kidata that he turned to. He appointed him acting commissioner general of the Tanzania Revenue Authority on December 23, 2015. Kidata launched a major crackdown on tax evasion in line with the mandate handed to him by Dr Magufuli who made the war against tax cheats one of his administration’s singular duty. He would shortly thereafter be shifted to the State House as Permanent Secretary on March 2017. He would then join a coterie of powerful officials with an ear to the Head of State. After about seven months at the State House, President Magufuli appointed Mr Kidata as Tanzania High Commissioner to Canada, one of Tanzania’s key trade partners. Canadian companies have invested heavily in Tanzania. Barrick Gold, the largest gold miner in the world has heavy presence in Tanzania through its subsidiary Acacia. Barrick is currently in talks with Tanzania over a major tax dispute. But it was in Canada where a construction firm, Stirling Civil Engineering Ltd, successfully attached Tanzania’s Bombadier aircraft to recover billions of shillings in a fine following a court case that Tanzania lost but had refused to pay. It now remains to be seen what lies ahead for Mr Kidata as he returns to his home country .